GE’s Profile™ connected kitchen suite of appliances makes life more manageable for consumers in a way that is very familiar and intuitive through their smartphones. 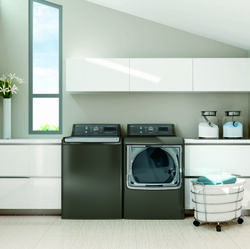 Moving beyond the kitchen, GE’s connected expansion includes a connected laundry pair and Wi-Fi-enabled GeoSpring™ water heater. 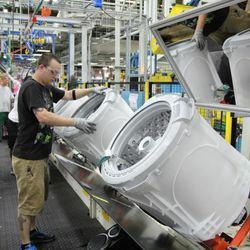 LOUISVILLE, Ky., — Jan. 5, 2015 — GE (NYSE: GE) has designed a full suite of Profile™ kitchen appliances, along with a laundry pair and water heater, to give consumers the tools they need to manage life at home, such as cooking and cleaning, via their smartphones. Launching throughout 2015, the new GE Profile appliances—ranges, wall ovens, French door refrigerator and dishwasher—will help consumers simplify tasks from remotely checking if ice is available to preheating the oven from the grocery store. Consumers spend more than two hours on their phone each day—and they aren’t just making phone calls. The majority of time is spent on apps. Phones have evolved from a form of communication into a conduit for the connected lifestyle. Beyond gaming and social media, consumers have doubled the time spent in productivity apps.1 As this interest grows, GE is making it easier to be productive with your phone and home appliances. 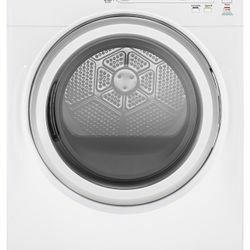 Stay on top of how much time is left for the wash or dry cycle. 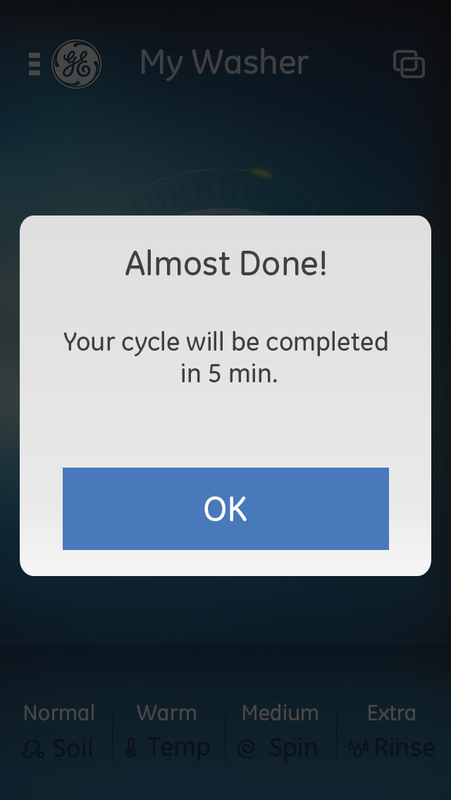 The GE Laundry app makes it easy to see when the load is done, conveniently from your smartphone. Whether you’re buying a single replacement appliance or the full suite for your home, each GE connected appliance has unique functionality and benefits available through apps. 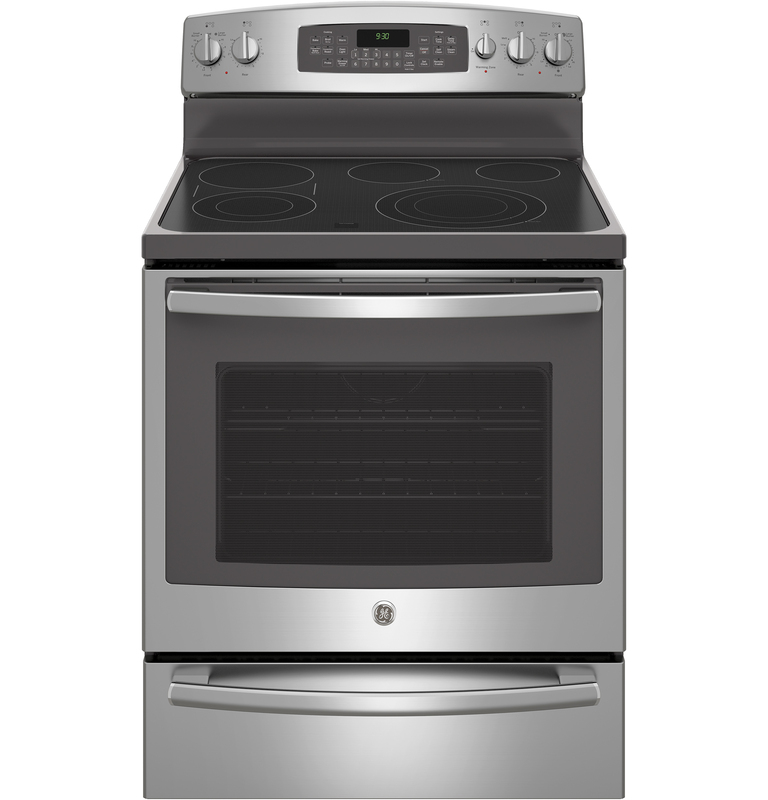 Wall ovens/ranges: As you rush to fix dinner, waiting for an oven to preheat can be inconvenient. Now you can preheat your GE wall oven or range remotely and quickly bring dinner to the table. 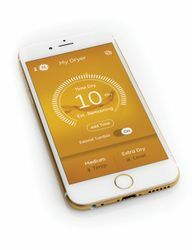 The app also allows you to set the timer, check cooking status, receive timely notifications when your food is ready and turn off the oven from inside or outside your home. 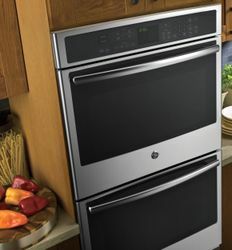 GE’s connected ranges and wall ovens are available now. French door bottom-freezer refrigerator: GE’s refrigerator app can notify you if the kids left the fridge door open and check whether your ice bin is full or not. Do you prefer filtered water, but often forget to change the filter? Now you can receive helpful reminders and order a replacement directly from your phone. 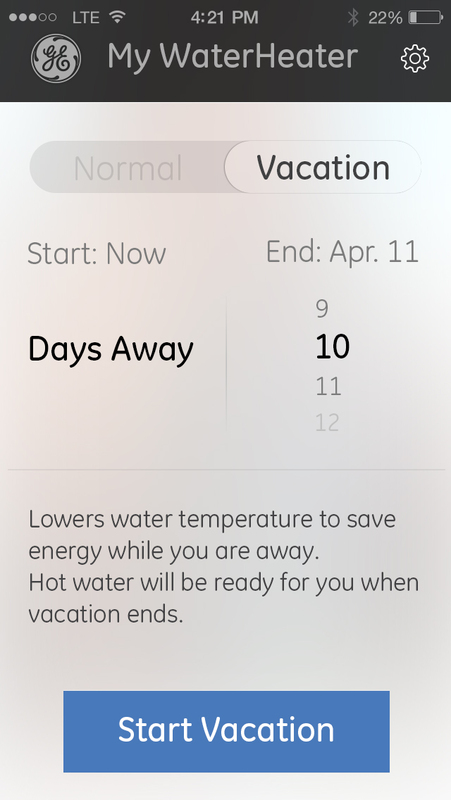 The refrigerator app also notifies you if your fridge’s temperature climbs above a set level after a power outage.2 The connected fridge and app will be available in April of 2015. Dishwasher: It happens to everyone . . . the skillet handle is blocking the wash arm or the drain is clogged because the kids didn’t scrape their dishes. 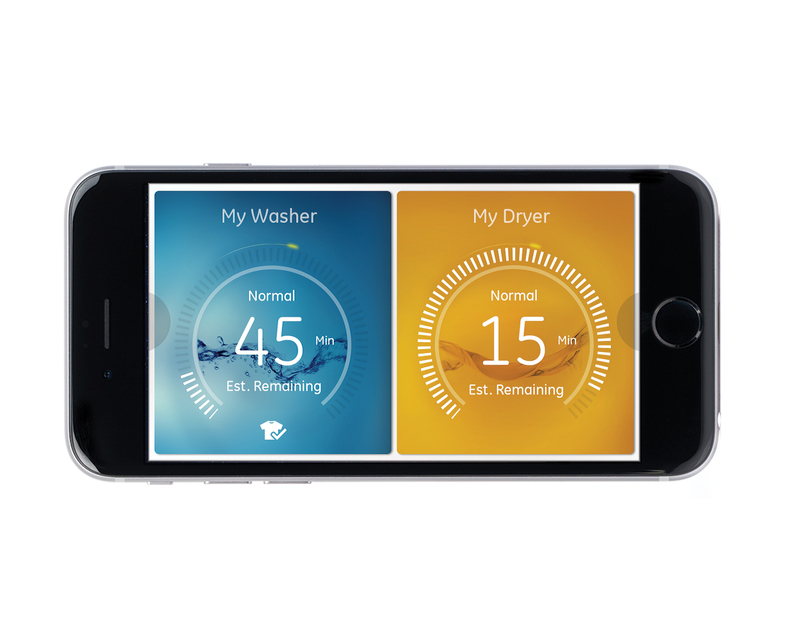 GE’s new app will alert you if anything prevents a less-than-perfect wash and when the load is finished. The dishwasher, available in late 2015, will also monitor performance and signal any leaks. Laundry pair: With most laundry rooms tucked away out of sight, it’s easy to forget to switch loads from the washer to the dryer and pull out your dress shirts before they wrinkle. GE’s new connected laundry pair, available in May of 2015, will help keep the iron away by sending alerts to your phone before the wrinkles set in. 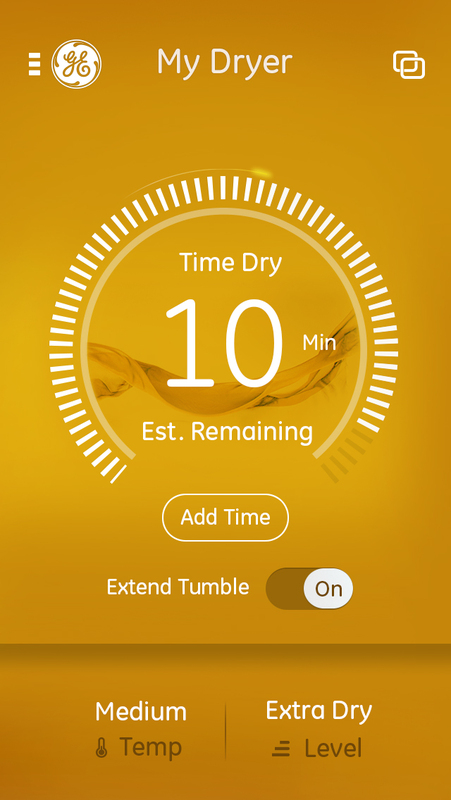 The app also shows how much time is remaining in the wash and dry cycles, allows you to download custom cycles, and keeps track of the detergent left in your SmartDispense™ reservoir. GeoSpring™ water heater: Available in February 2015, the recently updated GeoSpring 50-gallon water heater and the new 80-gallon GeoSpring are both Wi-Fi enabled through GE Connect Plus—a device that can be used with certain GE appliances to enable connectivity. Out-of-town guests staying over? Conveniently adjust the temperature of your water heater from your phone. Headed out on vacation? 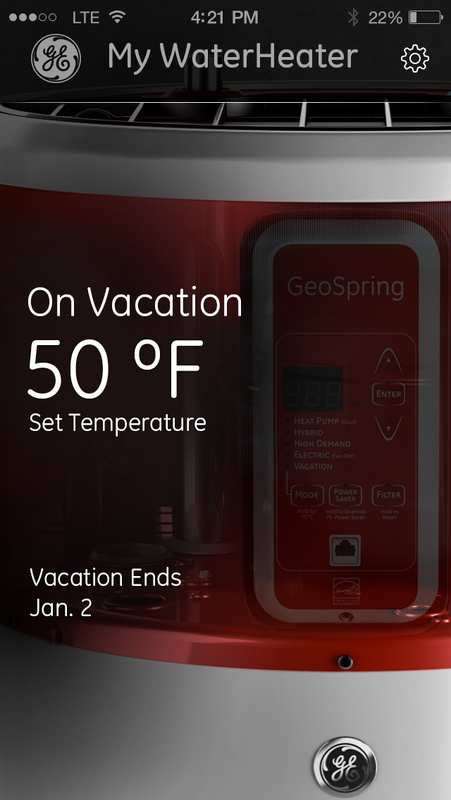 Schedule vacation mode while you’re away to save energy, and GeoSpring will heat back up when you return. 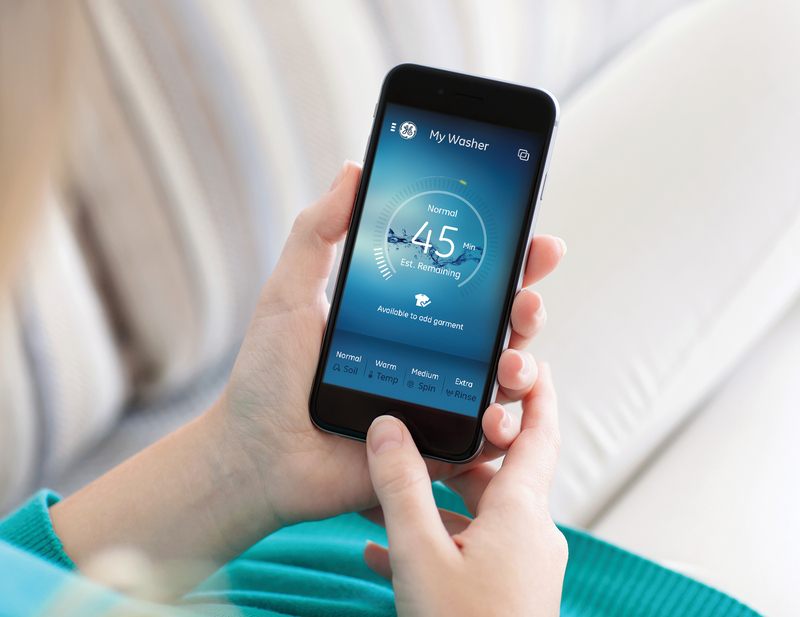 In addition to the convenience of what apps offer now, GE owners can keep their appliances’ software up-to-date, similar to updating a smartphone’s operating system. “As we add additional features to the appliances, it’s as simple as updating the app to receive the newest software for your connected appliances,” says VerSchure. GE’s connected appliances will also be capable of being managed with other systems, such as Wink, a connected home platform from Quirky, for optimal consumer flexibility. 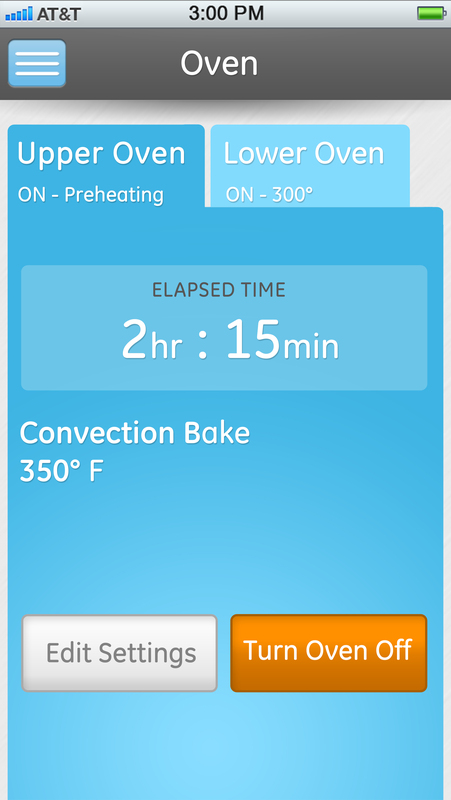 A Wi-Fi enabled wall oven lets you set timers, check cooking status or preheat your oven even when away from home. A WiFi enabled wall oven or range lets you set timers, check cooking status or preheat your oven even when away from home. A WiFi enabled range lets you set timers, check cooking status or preheat your oven even when away from home. Wondering when the laundry is done? 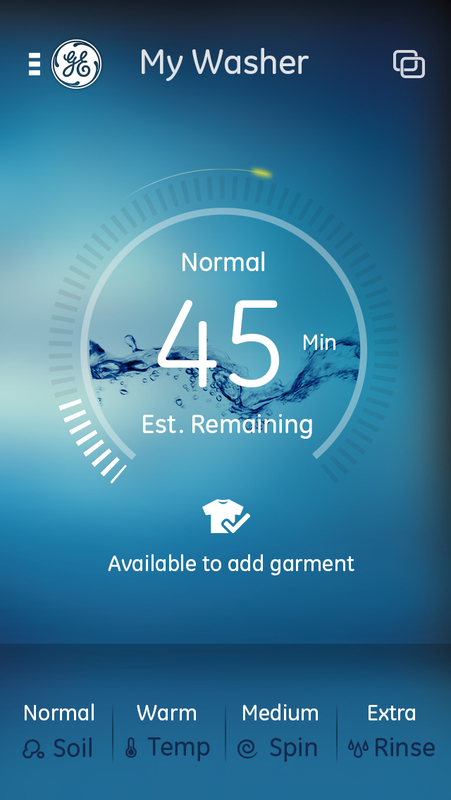 Simplify and streamline everyday tasks with GE’s smart appliances, such as by receiving an alert when your laundry is done. Adjust the temperature of your water heater from your phone, plus schedule the vacation mode while you’re away to save energy. Learn more about GE’s newest connected technology from Irena McDowell, user interface technology engineer at GE Appliances. 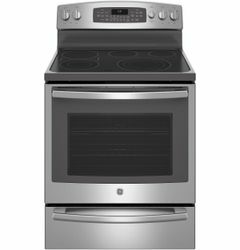 GE introduces its first free-standing ranges with Wi-Fi capability that allows consumers to control their oven while away from home via the Billion™ mobile app.